If there's any justice in this world, the 2010 Academy Awards ceremony's presentation of the Best Actor Oscar will go down something like this: in a gesture of overwhelming predictability and cinematic laziness, the statue is presented to everybody's favorite Wise Old Black Man Morgan Freeman for his inconsistent and pedestrian portrayal of the man he was born to play, Nelson Mandela, in Clint Eastwood's actually pretty bad Invictus. As the distinguished thespian thanks the Academy for this great honor, an unexpected guest crashes the stage. It is a young English actor by the name of Tom Hardy and he is fully in character and costume, which is to say he is naked as a jay bird save a gigantic mustache which makes him look like an Edwardian circus strongman, as the role he plays in last year's Bronson. He runs down the aisle, past all sorts of horrified/excited onlookers and storms the stage on live television in front of millions of people watching around the world and punches Freeman in the face and calls him a c-word. He then picks up the Best Actor Oscar and hurls it into the crowd at Avatar director James Cameron, cutting his head open and knocking him onto the floor. Hardy then calls Cameron a c-word as well. Co-hosts Alec Baldwin and Steve Martin rush to restrain Hardy, holding him back as Michael Stuhlbarg and Jeff Bridges deliver some cheap shots to his stomach and face. Before he is knocked unconscious he continues to yell the c-word at the Hollywood elite. The camera pans across the audience; Meryl Streep looks overwhelmed with womanly desire and Christoph Waltz shouts "That's a bingo!". Basically what I'm telling you is that Tom Hardy's performance in Bronson is pretty incredible. Denied a real release schedule in the United States, 2009's Bronson finally made its way to the Twin Cities as a midnight show at the Uptown Theater in Minneapolis this past weekend, and based on buzz and trailers alone, I took off to see it. Bronson tells the story of Michael Peterson aka Charlie Bronson: Britiain's most violent and infamous prisoner. Bronson has the unique distinction of having served thirty-four years in Her Majesty's Prison Service, thirty of which (so far) have been spent in solitary confinement. What started out as a seven year sentence for holding up a post office with a sawed-off shotgun (and making off with less than thirty pounds) has turned into a life term for continued attacks and threats against personnel and fellow prisoners, despite never having killed anyone. A life like this certainly demands a biopic. Hardy, an actor with the strange claim to having been cast in roles originated by both Patrick Stewart (he was Praetor Shinzon, the Picard clone from Star Trek: Nemesis) and Mel Gibson (he's the lead in the upcoming Mad Max sequel), delivers the performance of a lifetime as Bronson, portraying him as a psycho/sociopath who never really amounted to anything in the real world but has found his true calling in prison, he's really good at being a convict and doesn't want to be anything else. 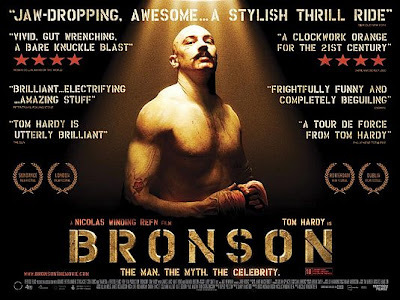 The film, directed by the Dane Nicolas Winding Refn of the "criminally underseen" Pusher Trilogy, tells the story from Bronson's point of view, positioning him as a narrator as unreliable as they come. The film cuts between dramatizations of Bronson's life in prison, his Cuckoo's Nest-like struggle to escape a mental institution, his brief furlough to freedom as an underground bare knuckle boxer, his ultimate re-incarceration and adventures as a career inmate and sequences of Hardy telling his story to a theater jam-packed with unseen adoring fans while wearing makeup that even Joel Grey would be uncomfortable in. Refn's movie can best be described as something of a mashup of Kubrick's Clockwork Orange (which it has been rightfully compared to without end) and more contemporary British portraits of the down-and-out like Trainspotting. It blends Trainspotting's affection for the absurdity of the life of small-time crime and social realism with Kubrick's visual aesthetic and themes of the state responding to violence. It would be easy to make this into a laugh-a-minute, over-the-top comedy by putting AC/DC's "If You Want Blood (You've Got It)" on the soundtrack, but instead Hardy and Refn deliver a nuanced portrait of a demented man. Bronson is all at once attractive and disgusting; there are times when you laugh and cheer when he beats the hell out of people and curses them out, only to find yourself horrified at his actions and your enthusiasm for them. All in all, I would suggest you give this a look when it's more widely available on DVD. Unless you're one of those weirdoes who hated both Clockwork Orange and Trainspotting, in which case you should be punched in the face by a naked guy and called the c-word.